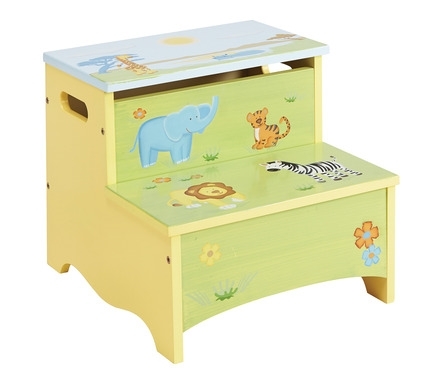 The Savanna Smiles Step Stool by Guidecraft features striped and spotted animals grazing and playing about the safari. The step-up, with a hand-painted lion, giraffe, elephant, zebra, tiger, hippo and more, features storage under the top step, angled back edge to prevent tipping, and cutout handles on the sides for easy carrying. Perfect for bathrooms, kitchens, playrooms or anywhere a little extra height is needed. Hand-painted elements bring the animals to life! Adult assembly required. Assembled dimensions:13L x 13.75W x 12H inches. Weight capacity 100 lbs.